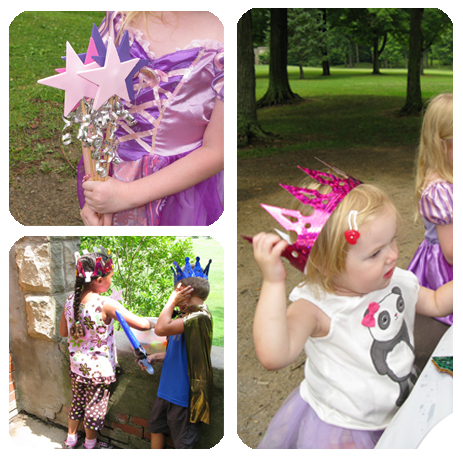 2 amazing children’s librarians + 1 awesome castle = the most epic birthday party ever! Both my girls have their birthdays in August and thus far we have celebrated their birthdays at the same party. This method may not last forever, but for the time being it is working well for us. Fiona still likes to share her birthday and Alexis doesn’t know the difference. 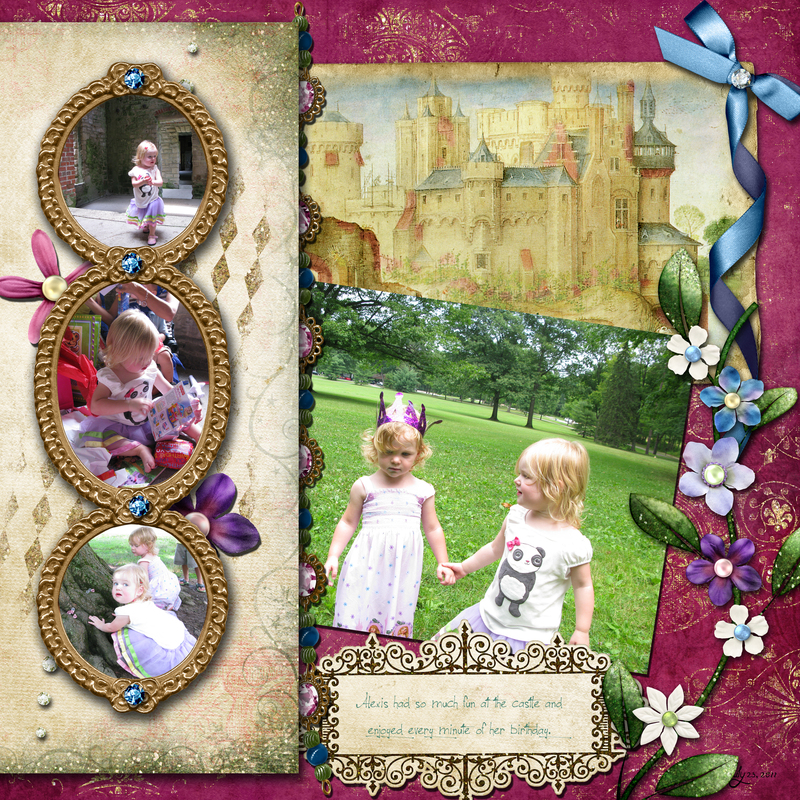 This August we celebrated Fiona’s 6th birthday and Lexi’s 2nd. A friend of mine, who is also a co-worker/children’s librarian, has a son who’s birthday is also in the summer. 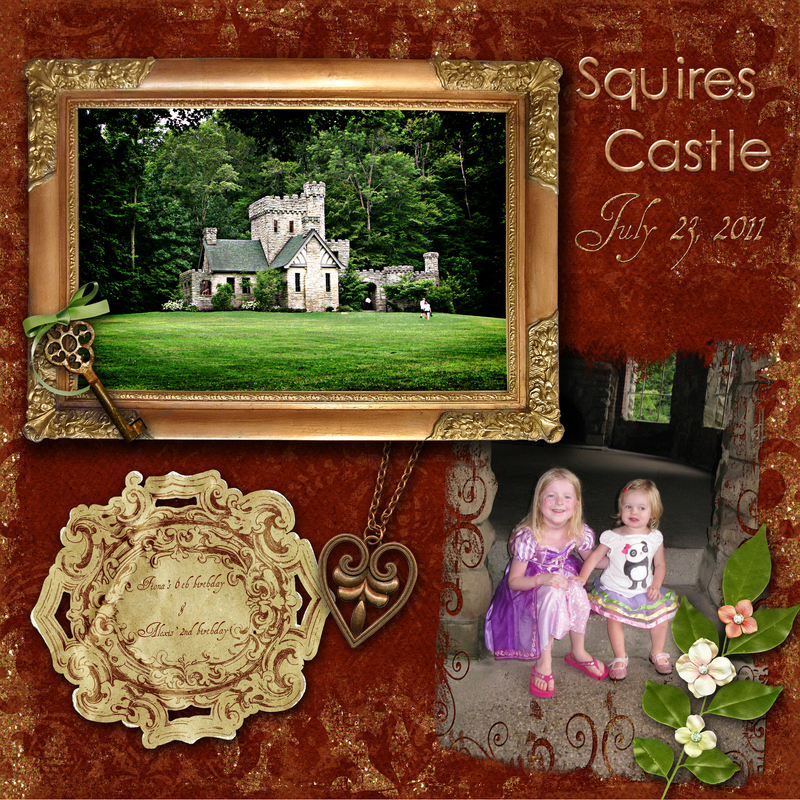 We were discussing birthday party options when she mentioned that she wanted to have his party at a place in the Metroparks called Squire’s Castle. I had visited this place a few times with summer camps when I was a child and loved it. It’s this amazing old manor house that fell into ruins. 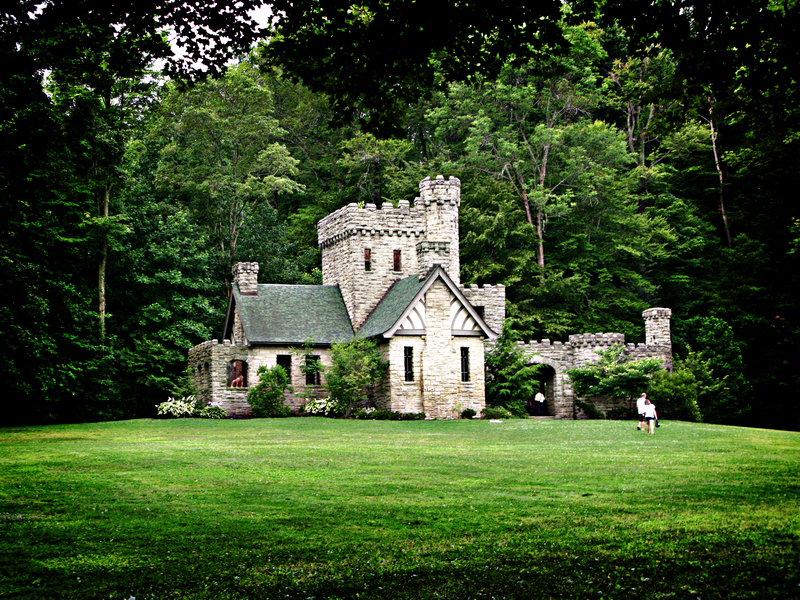 The Metroparks purchased the house and turned it into a park. The house really looks like this great old castle from another time and place. There is only one floor now as the second floor has rotted away; some of the roofing is gone too. It’s all open inside and it’s one of the most wonderful places around, in terms of just plain coolness as well as the imagination factor. I loved the idea right away. We decided to plan a combined birthday party for her son and my two girls. Needless to say we were both very excited. From orientaltrading.com we purchased blow-up swords, cardboard shields, lots of stick on gems, and paper crowns. I also made some cute wands from dowel rods, craft foam, and curling ribbon. We both cut out lots of pretty capes from scraps of fabric. Such as shiny gold, blue sequin netting, shiny pink, dusty pink velour, etc. 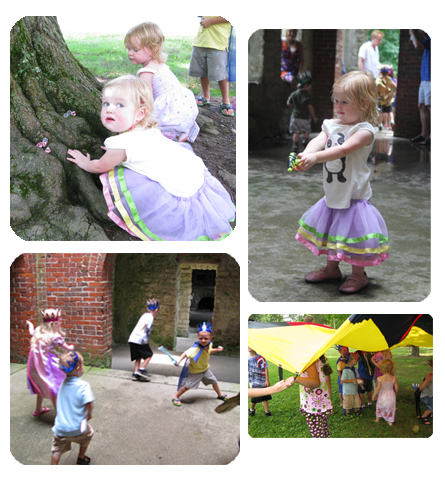 We made water balloons and brought water guns for the kids to have a water fight in the castle. (We made sure to pick up all the pieces of balloon afterwards!) It was such a hot day and we really wanted a way to let the kids cool off. This was probably one of the favorite parts of the party. Between the blowup swords, the balloons, and water guns this 2 hour party turned into a 4 hour one. No one wanted to go home! We had the parachute from the library and sang “Happy Birthday” to the three birthday kids while walking in a circle and shaking the parachute. Then all the kids ran underneath while the adults raised it up and down. 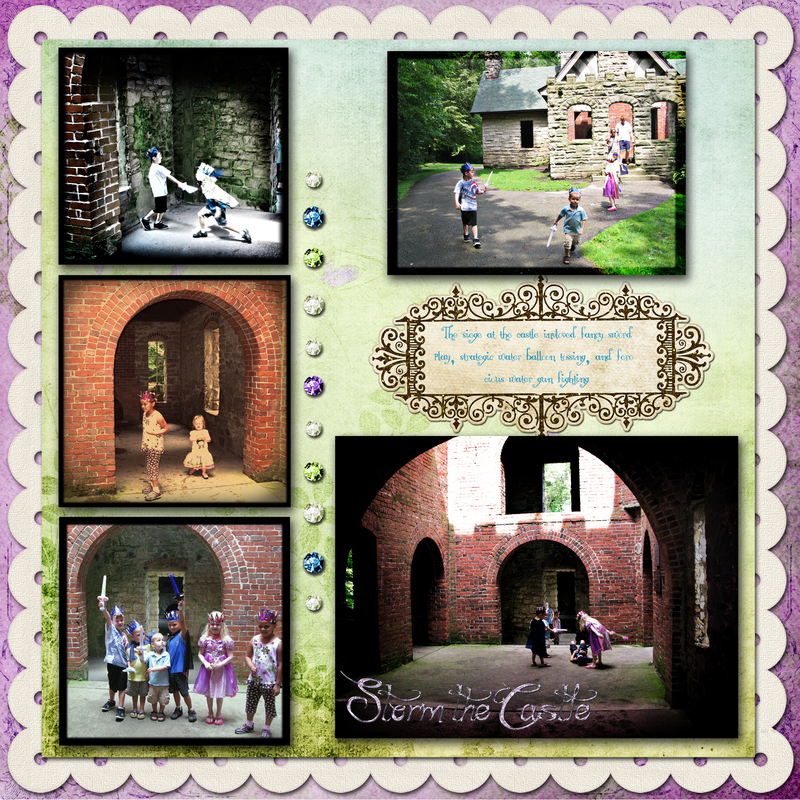 For the little ones, like my Lexi, we had a gem stone search. There was this one really cool old gnarly knobby tree with amazing roots and we hid the gems in the roots for the kids to collect. 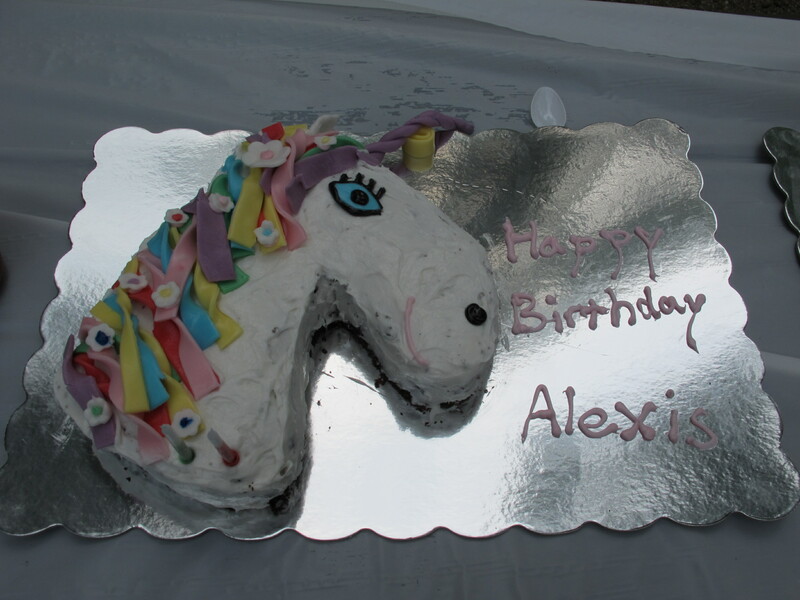 I LOVE making birthday cakes, and this is the one major downside to having birth girls’ birthdays in the same month. I wind up making two cakes for one party. Of course, they could share a cake, but I really like making cakes so I really don’t mind making two. But it always seems like we have so much cake. 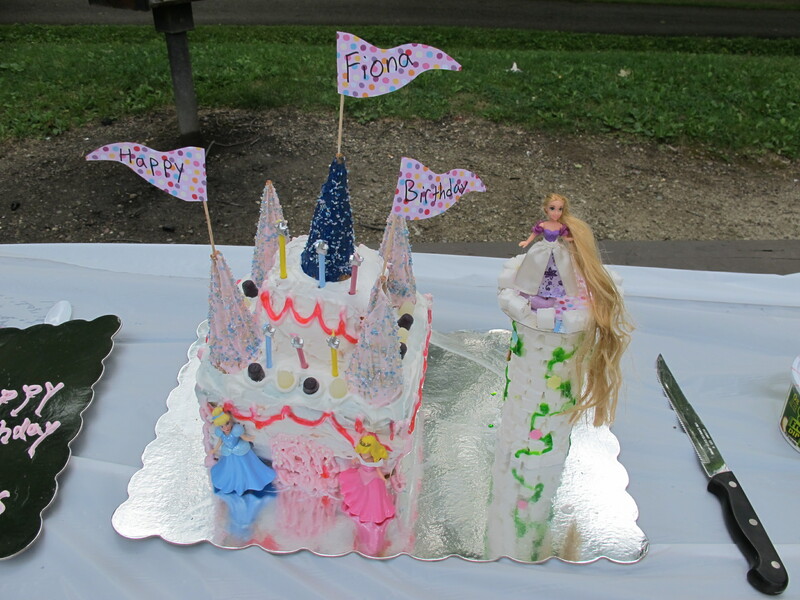 Fiona’s cake was a castle. I found the instructions on FamilyFun.com. 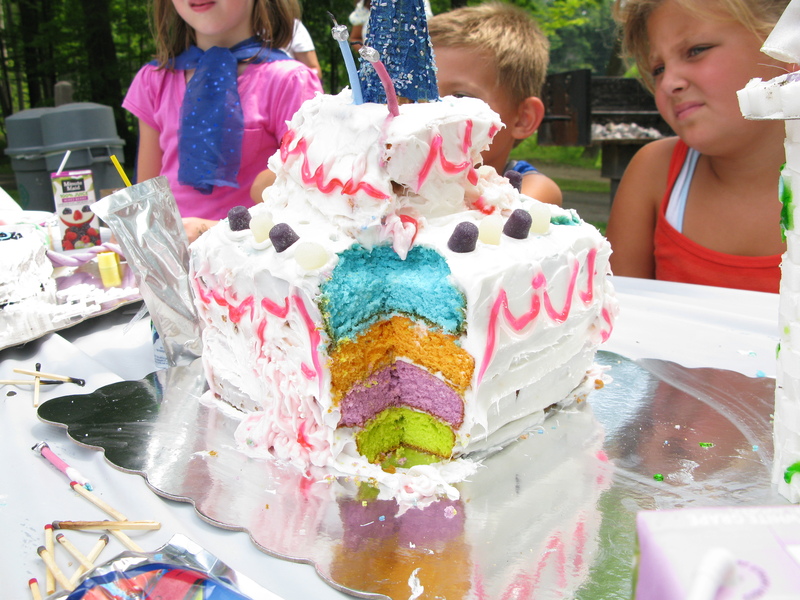 It was pretty easy to do and I made it really fun by making the inside rainbow layers (by adding some food coloring to the batter). 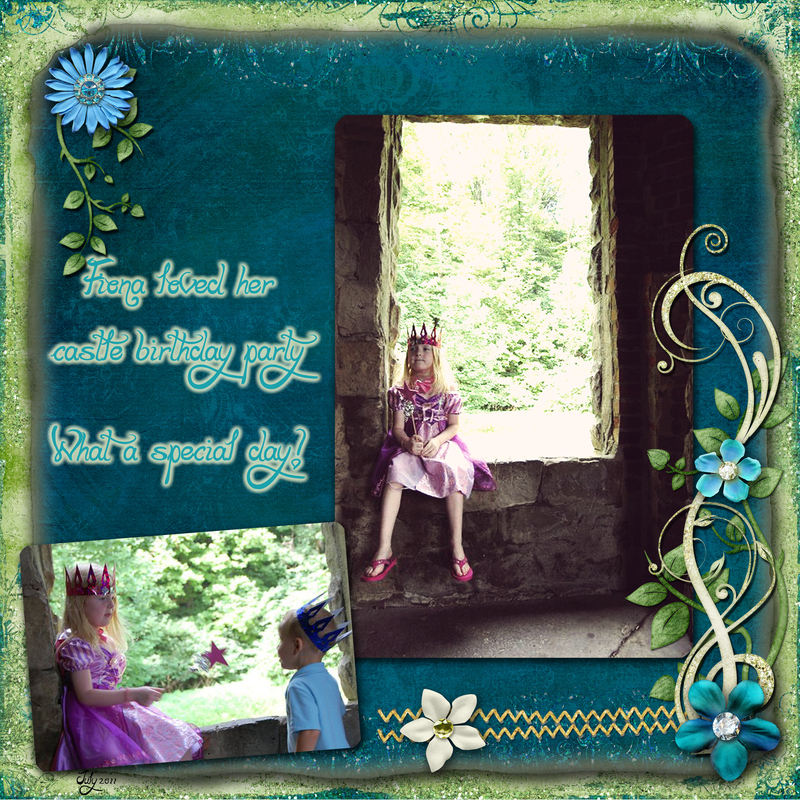 Fiona picked out some princess toys to put around the castle. 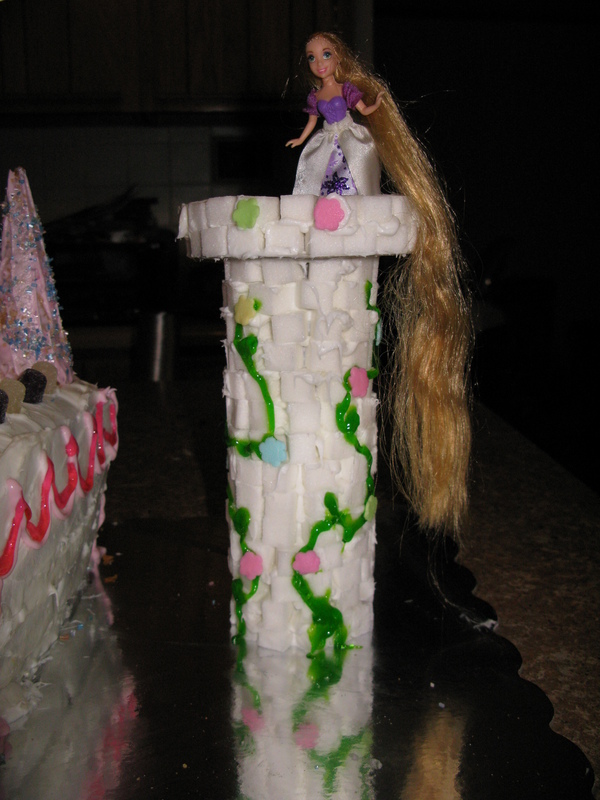 She’s really into Rapunzel now (thanks to the movie Tangled) so I also made Rapunzel’s tower by sticking sugar cubes to a paper towel tube with frosting.